Ohh seems like a nice beginning of April to me. 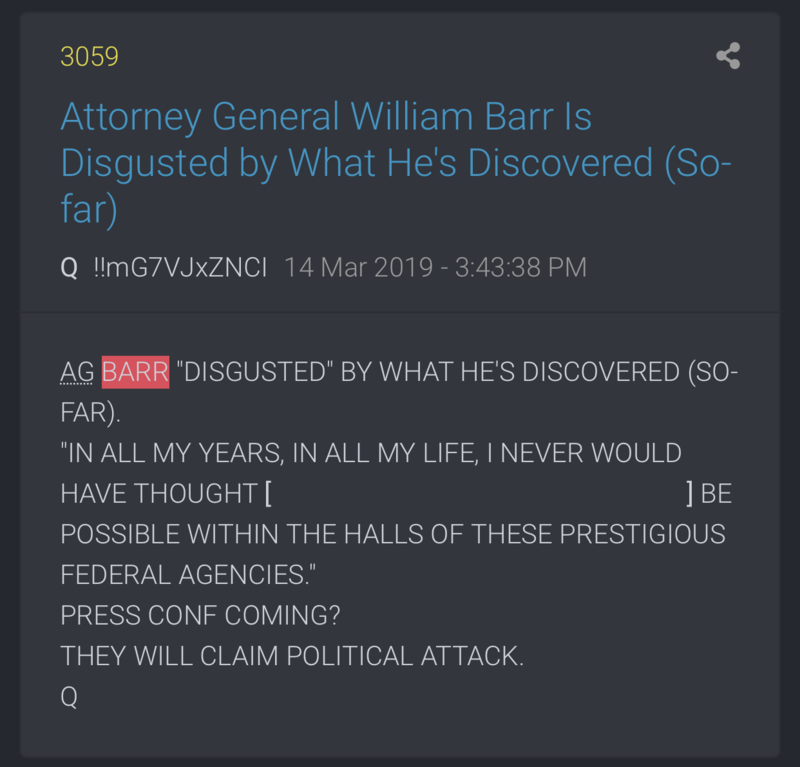 So, let’s say “Q”, believe it’s an insider or not, is correct about what A.G. Barr discovered in the Mueller investigation. Maybe he’s also sickened to find out that these people used their power to cover their crimes and go unpunished and untouchable until now. I think we all new this was coming. I wonder if Obama will be implicated? Hopefully Lynch doesn't lie during this investigation and get caught up like the FBI claim that Flynn did. The Deep State is in Deep Sh!t. Until these people are prosecuted. I have no faith in our Justice System. I don't think she can lie. I believe the tarmac tapes are in play here. This one isn’t about the Mueller investigation. I’d grab some popcorn now if I were you. I hope the DOJ is monitoring flights to non-extradition countries. The beauty of non-extradition treaty countries is you don't have to bring back the body, you must grease the right "wheels," have a good exit plan and of course, bring out the reqursted evidence lol.